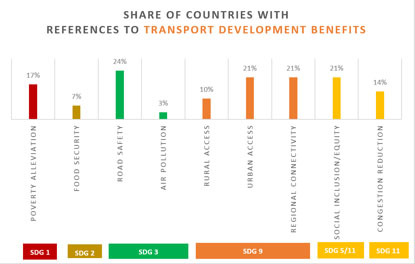 Although sustainable transport is not represented by a standalone SDG in the 2030 Agenda, it is mainstreamed in a direct or indirect manner into several SDGs. The Partnership on Sustainable, Low Carbon Transport (SLoCaT) reviewed the Voluntary National Reviews (VNRs) submitted by countries, the second SDG Progress Report and the draft HLPF Ministerial Declaration. SLoCaT found that while there is progress on transport’s inclusion in VNRs and SDG Progress Report compared to last year, there is still much work to be done to establish a structured framework that effectively measures the progress made in the transport sector towards the SDGs. To better understand how transport is reflected in the 2017 High Level Political Forum (HLPF) Process, the Partnership on Sustainable, Low Carbon Transport (SLoCaT) has reviewed the Voluntary National Reviews (VNRs) submitted by countries, the second SDG Progress Report and the draft HLPF Ministerial Declaration. We found that while there is progress on transport’s inclusion in VNRs and SDG Progress Report compared to last year, there is still much work to be done to establish a structured framework that effectively measures the progress made in the transport sector towards Sustainable Development Goals. While only 64% of the 22 VNRs submitted in 2016 contained references to transport (with not all references sustainability-specific), in 2017, 97% of submitted VNRs have some degree of reference to the transport sector, with 38% of submissions giving specific examples to link transport with sustainable development impacts (Figure 1). It is promising that seven countries have set specific transport targets (e.g. for e-mobility and energy efficiency) and seven countries have now provided data and figures to report on progress made in the transport sector to achieve specific SDG targets (e.g. deaths due to road traffic accidents, freight, and passenger transport volumes). This is an important step towards a more structured review of progress in the transport sector in implementing the SDGs. However, inconsistent data reporting on transport-relevant SDG indicators across the VNRs (e.g. highly selective attention to indicator 9.1.1 on rural access) also shows that the current VNR mechanism lacks the proper structure and framework to guide countries to report in a comparable and coherent manner. There remains a tendency in many VNRs to merely report on kilometers of highways built or rail constructed without demonstrating linkages to broader development goals. At the same time, there is ample evidence of sustainable transport policies and measures in the countries submitting VNRs 2017 (e.g. increases in urban and rural access), and it is not fully clear why this progress is not reflected in these reports in a more substantive manner. A Ministerial Declaration outlining the commitments of the ministers and high-level representatives from UN Member States to implement the 2030 Agenda is to be adopted towards the end of the 2017 HLPF meeting. The final draft of the Ministerial Declaration (as of 10 July 2017) gives very brief references to road safety and transport’s role in providing access and the importance of maritime transport and trade. The HLPF 2017 session on Interlinkages noted that the fundamental outcomes for country-level data are “whether people are better off, better nourished, and better connected.” Yet, the brief references to transport do not effectively outline the critical role of transport in addressing the overarching themes of the 2030 Agenda on poverty alleviation, food security, and leaving no one behind, nor does the declaration given an overview of progress made. For the declaration to gain relevance, it should incentivize and guide governments on how to take action in the transport sector through stronger linkages to the specific SDGs under discussion in the 2017 HLPF. We believe the HLPF process was set up to facilitate the sharing of experiences to accelerating the implementation of the 2030 Agenda. We believe it should also be a tool to mobilize multi-stakeholder support for the implementation of the SDGs. The VNRs, SDG Progress Report and the Ministerial Declaration deal with this guidance mostly in a general and seemingly haphazard manner, and sector related information, including for the transport sector, is often present in a cursory and qualitative manner. This very much limits the use of the HLPF process as a tool to inspire and guide other countries in taking greater sector-based action in support of the targets set by the SDGs. Thus, we suggest more specific guidelines for sectoral reporting in the HLPF process (as echoed in the HLPF 2017 Interlinkages session by the Centre for Policy Dialogue, among others). Finally, we underscore the need to incorporate inputs from a broader set of stakeholders in the VNRs, SDG Progress Report and the Ministerial Declaration to make these outputs more informative, comprehensive, representative and effective. Cornie Huizenga is the Secretary General of the Partnership on Sustainable Low Carbon Transport (SLoCaT) the leading multi-stakeholder partnership on sustainable transport that promotes the integration of sustainable transport in global policies on sustainable development and climate change and leverages action in support of the implementation of the global policies (www.slocat.net). This stage of the analysis applies to the 29 VNRs submitted as of 11 July 2017. Examples include the Global Status Report on Road Safety by the World Health Organization, the Logistics Performance Index developed by the World Bank.